Update: It's January 2018 and Vapros Spinner 2 is still one of several batteries in my vaping rotation. My daughter has got a new Vision Spinner 2, so we are comparing the two batteries and they seem to be practically the same. After a month of almost everyday use, it's time to let you know what kind of experience it is. Ecigarettedirect a.k.a. Smoker's Angel kindly sent me this one for review. On their site it is called Vision Spinner 2, and according to our experience there isn't much difference, if any between the two batteries. Vapros Spinner 2 came in a nicely designed, sleek double pack, properly protected. Its upper part is lightly indented - you can see this small circular pattern in the pic. It gives this battery a bit more rugged look than EVOD, even more accentuated by a bigger and more pronounced spin dial at the bottom. This is anything but a girly battery. Another non-girly thing is button, positioned like EVODs but not so light - you need a bit more pressing power. There's a usual 5 click on-off switch function and short circuit protection. Also, if you keep the button pressed for more than 8 seconds, the battery will turn off automatically. when button flashes fifteen times it indicates there's no power left. Charging time varies between three and four hours depending on the quality of your charger. Spinner 2 requires that standard eGo 4.2 charger many of you probably already have at home. Although it's difficult to say how much vaping you'll do before having to recharge, suffice to say that for most vapers this battery will work a whole day or more, unless you really vape low nicotine juice and use low resistance coils. I've noticed that with 0.6mg nicotine e-liquids and 1.2 ohm resistance coil, I go through battery and juice like crazy, almost twice as much as my normal 2ml a day. Digression: Vaping can be as cheap/expensive as you yourself choose it to be. Put good old plain ce4 or EVOD on this battery, set it to voltage that starts with 3. and you'll save some money. If big clouds of vape aren't your thing, of course. What we all love about these types of batteries is the option to adjust it. Spinners have four voltage value for you to set and in case you are new to this, here's the chart to tell you all you need to know about clearomizer's coil resistance and battery voltage compatibility. 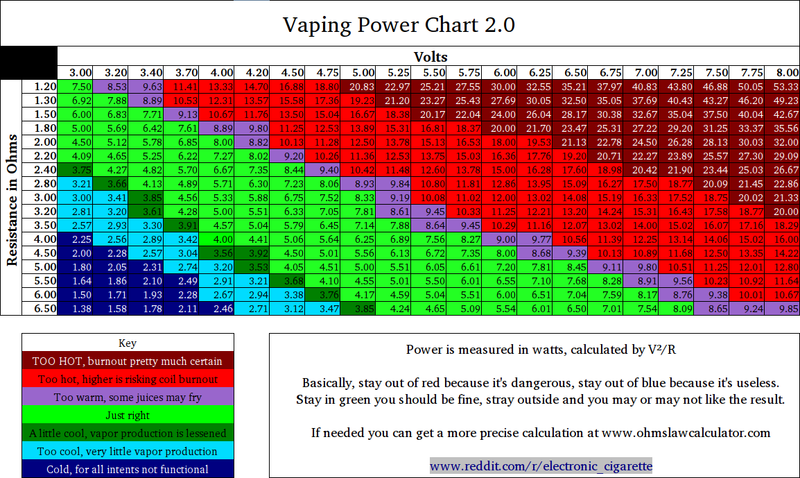 For those of you just starting, here's a link to the volt-ohm chart that will help you find ohm ratings to match your chosen voltage or other way round, so that you can find what's commonly referred to as "your ideal vape". As for clearomizers that go well with Vapros Spinner 2 (or Vision Spinner 2), the selection is rather big - everything 510 compatible, and that's more than 90% of clearomizer stuff today. All EVODs, Kangers, Aspires and ce4's or Vivi Novas - any will do. Buy Vision SPinner 2 in US at Central Vapors. They also have a smaller version, Vision Spinner 2 Mini (smaller size, 850mAh capacity).